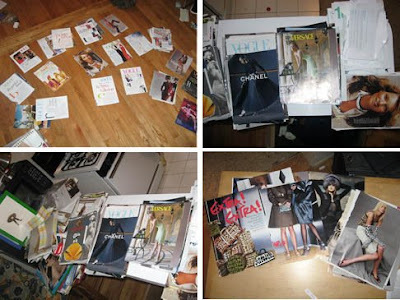 I finally got around to organizing my old magazine clippings. I was looking through them and wishing some of them were in better condition, that I took better care when ripping the pages out and then I realized that some of these clippings are 14 years old. Can you believe that? It's a wonder they've even lasted this long to begin with and considering that I was 10 when I started ripping stuff out, it's ok that they aren't all in perfect condition. The only bummer is that the Nadja Auermann/Helmut Newton shoot that I've been obsessed with since forever ago is NOT in the clippings! AAAH! What should I do? I'm pretty sure I didn't throw it away or anything, I'm very heartbroken over this. I plan on scanning them all and keeping them as a digital archive, so I'll be posting some oldies and bringing back From the Vaults, which I quote enjoyed doing. Are you so excited? I AM!